Biker Kiss started in 2001 as a biker dating site for motorcycle riders that wants to meet other riders online for a relationship, date or friendship. It caters for about 500,000 singles from the UK, US, Australia, Canada and other countries. Its features are unique and specially tailored for all bikers. Biker kiss partners with other biker sites, event organizers, and some local clubs just to bring you close to thousands of other biker singles that have a lifestyle similar to yours. The site has a good UI design and its layout is easy to navigate. You can read success stories from members who have experienced the site and you can find answers to some frequently asked questions on the homepage. 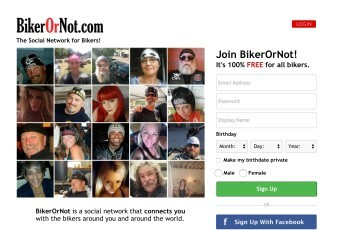 It is free to sign up on Biker Kiss but it could take a little time to complete the form. You will provide your first name, email, age, choose a username and password, choose your motorcyle, ethnicity, relationship status, height, select your gender and the gender you seek, your country and your zip. After you have been registered, you will be able to build or modify your profile, and upload your photos. You can then start to surf through the list of available members or make specific searches and communicate with anyone you are interested in. You can go through their profile and view their photos. You can also wink any member you like and can send messages to them too. It has a mobile app for androids and iOS devices. Your subscriptions are refundable if you request for it. It carries out underground checks, license verification, and assigns a “Certified Member” badge on profiles that can be trusted, to help reduce scam. Only the Gold membership plan offers unlimited access to all the features on the site and it’s available only upon subscription. Biker Kiss is a professional biker dating site with a large member-base of motorcycle riders from various parts of the world ready to mingle with other biker singles. You can join over 500,000 other singles on the platform and build your profile for free. The Gold membership plan gives you unlimited access to the site though it’s a little bit priced, but you will get a good value for your money. You can enjoy chatting with your biker friends or partner even while you are away from home on your phone via its mobile app available on both android and iOS devices. If you are a real biker, Biker Kiss is the safest and the most suitable platform for you to try biker dating as it offers special services and has unique features put together to help you find a good date that has the same lifestyle as yours online. You can join, create a profile for free and upload up to 26 photos. You can send “winks” and use “icebreakers” in your conversations. You can send emails and you can exchange messages with other members. You can make specific searches on some category of members with its unique search engine. You can join the “verified members” list to increase your chances of finding a date and to let people know you are for real. You will have access to dating advice, safety tips, and success stories. It has a responsive customer care service and you can use the FAQ section to get quick answers to basic questions. Some of its special features includes “motorcycle garage”, “biker tattoo”, “backseat or passenger”, “certified biker” etc. *Visit the website for the latest Biker Kiss pricing.